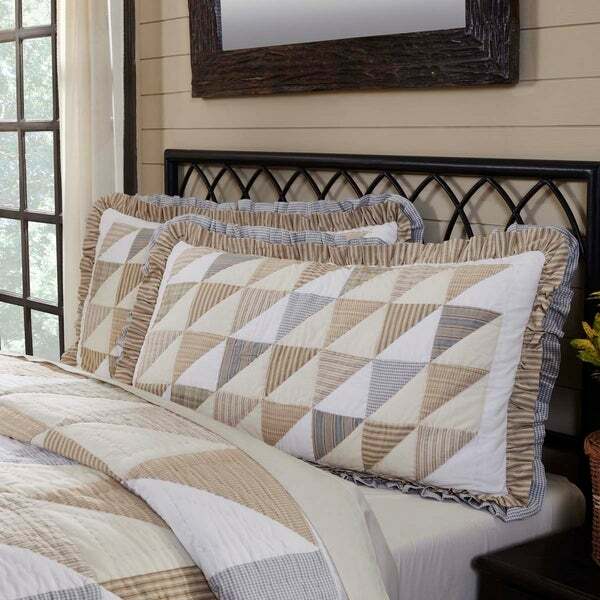 This is a beautiful quilt and sham! The Joanna Sham features interlocking triangles in a carefully arranged patchwork of solids, stripes, plaids, and microchecks. Soft white, creme, golden tan, and powder blue showcase a fresh farmhouse look. Trimmed with 2 and 3 inch gathered ruffles; blue ruffle extends from the sham and is not a false trim. 100% cotton, hand-quilted. These shams are very nice, but very expenive. They washed well on delicate & low heat in dryer.